Situated in the southern part of the United States, Arkansas is the 29th biggest state in terms of physical size and the 33rd most populous. This state is therefore the 34th most densely populated, with an estimated population of just over 3 million people. Arkansas covers an area of 53,180 square miles. This state is known for its varied landscapes, including mountainous areas like Ozarks and Ouachita Mountain Range, as well as its wooded areas like the Arkansas Timberlands. Arkansas was part of the Confederate States during the Civil War and is known for its unique culture, which has come about due to a blending of different types of people over the years, including Native Americans, African slaves, and European settlers. 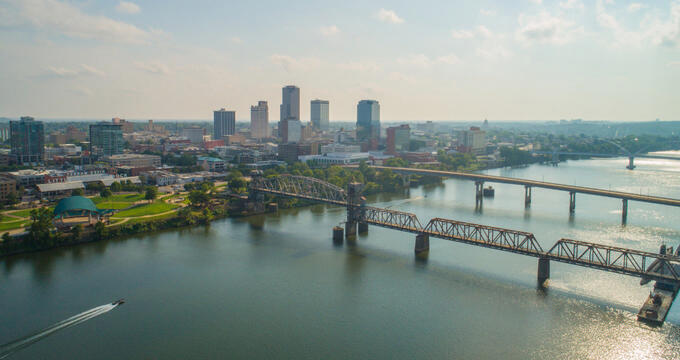 The capital city of Arkansas is Little Rock, which is also its largest city. Here are some additional facts, statistics, and overviews on the largest cities in Arkansas. Located in Pulaski County, of which it is the county seat, Little Rock is the largest city in all of Arkansas and is also the state capital. Little Rock is also the only city in Arkansas to have a population exceeding 100,000. The city covers an area of 122.02 square miles and has an estimated population of 198,000, with over 738,000 people living in the surrounding metropolitan area. Little Rock is situated very close to the geographic center of the state and was constructed on the southern side of the Arkansas River. It was named due to a unique rock formation near the river, which had been called 'La Petite Roche' (The Little Rock) by a French explorer surveying the area. Little Rock became the capital of Arkansas Territory in 1821 and continued as the state capital ever since. The city is a key cultural and economic hub for Arkansas, home to the largest businesses in the state, along with many attractions and monuments. Located in Sebastian County, of which it is one of two county seats, Fort Smith is the second biggest city in the state of Arkansas. This city covers an area of 68.26 square miles and is located on the western border of the state. Fort Smith has an estimated population of 88,000. The land that would eventually become Fort Smith was inhabited by Native Americans for many millennia until European settlers arrived on American soil. French settlers were the first in the area, creating various settlements all around Arkansas. Eventually, after the Louisiana Purchase of 1803, new towns and settlements were formed. Fort Smith was created as a military installation in 1817 but started to grow into a settlement over time. Located in Washington County, of which it is the county seat, Fayetteville is the third largest city in all of Arkansas. It is situated in the northwestern part of the state and has an estimated population of 85,000, with over 490,000 living in the surrounding metropolitan area. Fayetteville covers an area of 55.41 square miles. This city was founded in 1828 and was originally named Washington in honor of George Washington, but was renamed quite quickly to Fayetteville, after the city of the same name in the state of Tennessee, which traces its name back to General Lafayette, a French military leader involved in the Revolutionary War. Fayetteville is best known as the home of the University of Arkansas. Located in both Washington and Benton Counties, Springdale is the fourth largest city in all of Arkansas. It is situated on the Springfield Plateau and covers an area of 47.29 square miles. The estimated population of Springdale is 79,000. This city is located in the northwestern part of the state among the Ozark Mountains and has long been an important industrial hub for Arkansas. It was originally named Shiloh in honor of the local church, but changed its name a few decades later. Due to its location, Springdale is a good base for anyone exploring the Ozarks. Located in Craighead County, of which it is one of the two county seats, Jonesboro is the fifth biggest city in all of Arkansas. This city covers an area of 80.55 square miles and is located in the northeastern part of the state. The estimated population of Jonesboro is 75,000. The city was founded in 1815 and was originally named Jonesborough, in honor of the state senator, William Jones. The name was shortened to Jonesboro in the years to follow. Jonesboro is best-known as the location of the Arkansas State University, the second biggest college in the state.